Factory Bay, Australia "Glass Beach"
Factory Bay South Australia "Glass Beach"
Thank you for your Odyssey sea glass site. I have tried but unfortunately am unable to post the pictures? 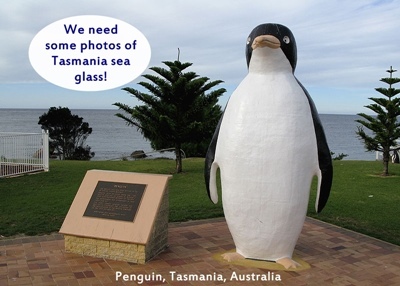 I thought it was high time I email you something of evidence that we do have sea glass down under! These are from ROBE South Australia. Your history/research is correct that this little cove is known as Factory Bay. I have spent hours and hours here picking up glass. Mostly brown and clear well rounded pieces. All the pieces pictured I found were from a day trip to Robe from Adelaide (5 hour drive one way). Please feel free to use these photographs... Maybe post them onto the comments thread. I apologise for the delay in contacting you with some pictures. In all honesty my passion of late, marathon training has taken up my glunking time. Great report, Sandi! 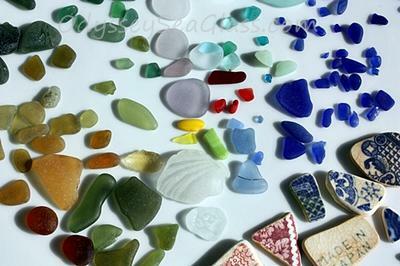 We had been asking for more photos of sea glass from Australia, since we had lots of good reports/comments but few photographs of what really was being found at the various beaches (see below for more reports..
Well, Sandi came through with the best proven report on sea glass in Australia. Wow! 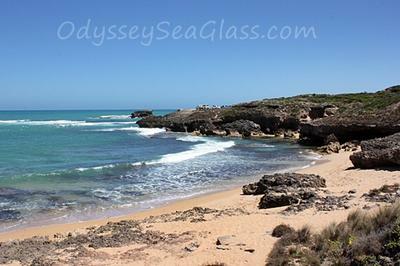 The best place I've been to on holidays and came across sea glass was in Robe, South Australia. There was more sea glass than sand! It's the beach to the right of the only lighthouse in Robe. We happened to stay in a holiday house literally right opposite the beach and accidentally came across it while looking through their sight seeing brochures. I couldn't get there quick enough! It was the best experience ever! Check out the cave there too! 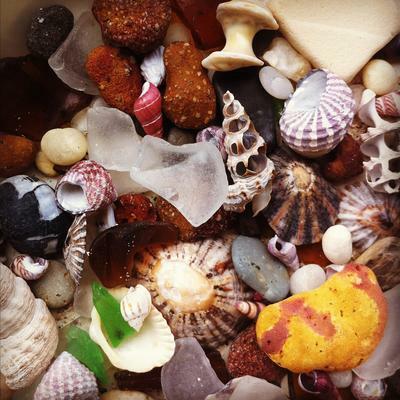 All the sea glass collects in it and my hubby and I had an absolute ball collecting sea glass! We came home with buckets and buckets of the stuff! ROBE South Australia, did not disappoint! After reading the comments to find 'bucket loads' of sea glass in Robe, South Australia. Since May I've been keen investigate this claim. It was worth the wait...AMAZING! 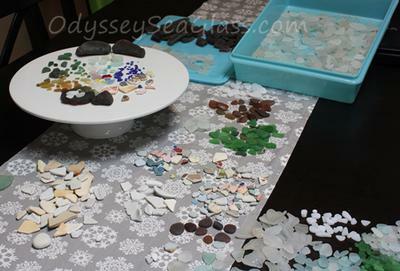 My family spent glorious hours picking up well tumbled browns, whites,clear, sea foam,and greens. I even fond a purple nugget! I repeat I have never seen piles of frosted sea glass before. Terrific finds and terrific weather...perfect. 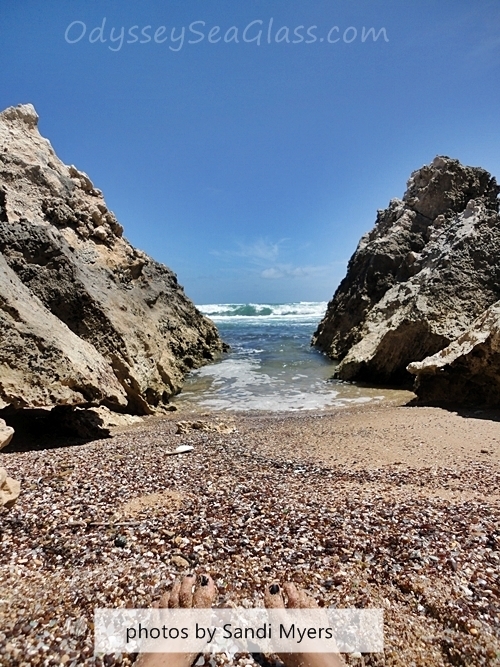 Factory Bay was originally the site of a canning factory that used to can snipe and rabbits. After the World Wars it was used as Robe’s rubbish dump before people had an aware- ness of protecting the environment. Hotel green & brown bottles were dumped here and washed back into the cove. The area was also known as Glass Beach from the polished sea glass. 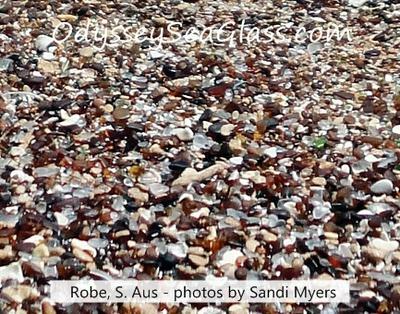 Comments for Factory Bay, Australia "Glass Beach"
I went down to Robe yesterday (24 October 2016) to check out the beach. Arrived a little early for low tide though. I collected roughly one bucketful through a combination of picking up pieces on the surface and digging to look at what had been buried. From the digging I can say that a lot of it is buried, though not very deep. It may be worth waiting a few months to see if the sand washes away again, or if more glass washes up. Had a fantastic time at Robe but I must have been searching in a different area to you. I parked in the carpark at the top of the cliffs to the right of the light house and walked down to the left. There was a cave to the far right of the cove I visited. Didn't see the glass in prolific amounts like in your pics but it was on the high tide line and most of it was in the cave. I couldn't get over how smooth the pieces were! I will try again to upload my pics so you can see where I was. There was another, smaller cove to the left of the carpark but it was mostly covered in thick kelp and it wasn't as easy to access so I didn't get down there. Maybe that was the beach you were at? When I refer to left and right I mean if you were standing at the top of the cliffs looking out to sea. It was certainly worth the LONG drive, I got so much seaglass! I ended up not picking up any browns/ambers because I have so many. When I look at how much I collected I can understand why my back was so sore and required a trip to the chiropractor when we got home! We went to Glass Beach SA at Easter and I had a great time there! Originally I had planned an itinerary to explore all the beaches at Robe but that went out the window after visiting Glass Beach/Factory Bay. You can actually see the glass coming in on the waves - amazing. There's even a large boulder to the far left of the beach that is coated in sea glass that has adhered itself over many decades. All the pieces I collected were beautifully worn and very, very smooth. You will find the majority is brown/amber or white/clear but I did find some little greens, lots of pale blue, two tiny lilacs, two royal blue and some porcelain shards. I went at low tide (which I would recommend as the reefs are more exposed) but I found even walking the high tide lines when the tide is going out presented lots of pretty pieces. The cave at the right end of the beach seems to hold the majority of the pieces - I was on all fours right at the back of the cave having a field day; goodness knows what anyone watching me was thinking!!! I have some photos but having trouble working out where to upload them. Another tip - check your footprints as you walk the beach; there is so much glass buried in the sand that your footsteps will push more up as you walk. Definitely worth a visit though the glass was nowhere near as prolific as in Sandi's photos. I would say a lot of ppl have collected here over the years but there is still tons of it buried in the sand and its still all over the reefs. Thanks so much for this amazing report. I gotta get over there asap! That's a day's drive there, a day to collect and a day's drive back. Looks like a Road trip in the making. off to Robe we go, Woohoo! After 2-3 years of begging my husband surprised me today by booking us into an apartment in Robe for a few nights during the holidays. So excited, can't wait to get to glass beach. If it's as good as I've heard I'm going to make a snow angel in it!!! Will get lots of pics for everyone. I still have to do my beach report for out Lorne weekend. Hi Tania. I went hunting at low tide in this spot. You can't access it at high tide. Even at low tide I had to be so careful of the sudden and unpredictable swell of the ocean. It is a very HAZARDOUS area if you're not paying attention. Safety first! It's amazing how addictive this past time is! Seeing these pics makes me want to jump on the next coach to Robe with a bucket in hand!!! I'm in Lakes Entrance (right on the beach but ironically it has not a speck of sea glass, the conditions are all wrong for at least 100km either way). Robe is a good 8-10 hours drive away but by the looks of it, it would be well worth the trip! Did you go hunting on low tide? What is it about hunting for these little gems, that aren't really valuable, that is sooo addictive? !